For my smallmouth fishing, I switch between an EZ Popper (shown here) and a Floating Minnow, depending on how the fish react to the flies. An EZ Popper creates a lot of disturbance; the Floating Minnow is more subtle. CASTING A FLOATING FLY and watching the take, whether it’s a busting strike or a simple gentle sip, still gives me goosebumps. Smallmouth are a great gamefish because they attack flies on the surface, and nothing beats the visual excitement of fishing a floating fly for smallmouth in clear water where you can watch the fish follow and swallow your fly. Surface flies are such an important part of fishing for smallmouth that fly fishing for smallmouth bass used to be called popping bug fishing. Most people never bothered with sunken flies for bass. Surface flies can be used to match the hatch when aquatic insects such as mayflies and caddis or terrestrials such as hoppers and ants are on the water. They can also be used to match minnows swimming close to the surface because they are crippled or perhaps feeding on the surface on emerging bugs. But surface flies can also be used when nothing is going on. Few things in nature that move across the surface of the water can’t be eaten by bass. Who knows what the bass takes your popper for, but one thing is true: A lure chugging across the surface is often hard for a bass to resist, and even when you aren’t catching fish, casting and watching a popper chug along the surface of the water is fun. Many different styles of surface flies have been designed to be fished in a certain way, at a specific water depth, or to present a different characteristic. Each style of fly is best suited to match particular water conditions, the mood of the fish, and the way in which the fly is retrieved. As with many other things, however, there are no hard-and-fast rules; flies designed as streamers, such as the Muddler Minnow, can be fished on the surface, and flies designed for the surface can be fished on sinking lines. I’ll talk about poppers, divers, floating minnows and sliders, and trout-style dry flies. These are the styles of flies that have been effective for me over the years. Other anglers have good luck with surface flies with small propellers added, like the Jitterbug bass fly; blades to make them dive, like the Rapala lures; or the Crease Flies designed by Joe Blados. These flies work, and as with all things in fly fishing, fly selection has as much to do with the angler’s preferences as it does with the fish. I like to keep my fly selection as simple as possible. Smallmouth, like trout, rise selectively to insects on the surface, but more often than not, they can be induced to take most any fly. For smallmouth bass, flies designed to look like the natural usually do not work as well as the ones that mimic their movements. Surface flies that imitate struggling insects or crippled baitfish disturb the water’s surface, and they provoke strikes even though they really do not look like baitfish. Bass respond well to movement, so a fly skittered or twitched on the surface often gets the fish to bite. But the type of movement often can make a difference. 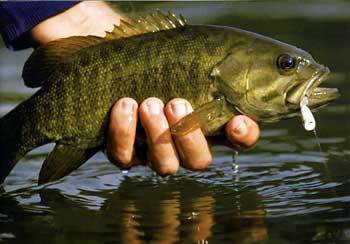 At times, noisy surface activity spooks smallmouth, whereas quiet presentations entice a hit. You can control the way the surface fly moves through a combination of retrieves and fly design. Presentation, accuracy, and action are important factors in successful bug fishing. Just because a particular technique worked one time doesn’t mean it will be productive the next. Sometimes bass like a bug chugged across the water’s surface. Other times they only take a dead-drifting fly that is twitched periodically. Once I was pulling a boat with some clients into a cove between a series of rock ledges when I spotted bass busting up a school of baitfish. After I had brought the boat into casting distance, the angler in the bow cast his topwater bug toward the commotion caused by the feeding bass. The bug hit the water, and the angler stripped it once and let it sit, but nothing happened. He picked the bug up off the water and cast again. This time, as soon as the bug fell to the water, he started a steady stripping retrieve. Two large smallmouth moved toward the bug, and one of them inhaled it. This experience — and many others like it — taught me to experiment if a particular retrieve doesn’t work. Good anglers constantly modify subtle things, such as the length of strip, length of pause, or the frequency with which they strip the fly back before pausing. Sometimes getting a fish to strike is as simple as knowing when to stop retrieving your fly and let the fish take it, or gently twitching your popper instead of stripping it back hard. Though I describe some general retrieving styles below, there isn’t a simple formula for catching bass. Many of the best anglers learn by experimenting with different retrieves after they have found one that works. How do you know the bass only wanted a fly stripped quickly if you don’t try anything other than stripping the fly quickly? This is one lesson you can learn from inquisitive anglers who experiment even if it means catching less fish. If all you do is fish a popper with a steady retrieve and you are catching fish, how do you know that it is the best technique? One important thing to remember is that in most circumstances, the action you impart to the surface fly comes from the design of the fly and your stripping hand. Although there are exceptions, for the most part you should not use your rod tip to manipulate a fly you are retrieving. Waving the fly rod tip up and down or back and forth creates slack in your line that will prevent you from quickly and firmly setting the hook on a fish. This method is possibly the most common retrieve. Begin with the tip of the rod just above the water’s surface, with the tip pointing down the fly line and in line with the popper. Pull or strip the fly line, forcing the popper to move toward the rod tip. Usually the length of the strip or pull can vary, but the popper should move about six inches at a time. Pause before stripping again. Smallmouth strike during the pause, so stay alert. This method portrays an injured or dying baitfish. In this retrieve, do not allow time for the fly to pause in between strips. This can be the most exciting of all retrieves. It portrays an escaping baitfish or even a land animal scurrying, panic-stricken, across the water’s surface. I have seen some large smallmouth attack the popper with vengeance when this technique was applied. Lefty Kreh favors this method when using his famous Lefty’s Bug. This retrieve can be deadly when stripped across stream. Bob Popovics, an angler experienced with the fickle moods of striped bass on the New Jersey coast, changed up his popper retrieve and was rewarded with a nice bass. stripped forward.This takes a little practice but can make up for the many strikes that otherwise would not occur. The time between the pop and stop can be adjusted and should be varied until the strikes start. Anglers who use this technique should be aware of subtle takes by large smallmouth that will, at times, inhale the popper without leaving any sign on the water’s surface. The pop and drift is used mainly in clear water with wary smallmouth. At times, smallmouth spook when anything hits the water’s surface and scurry for cover. The angler should be aware that noise sometimes deters strikes and should not move the popper until it drifts undisturbed over the water’s surface. These long drifts from at least three through ten feet will usually bring up a wary smallmouth. If no strike occurs during the drift, try moving the popper with a subtle pop or twitch. The dead drift can be employed during a hatch of insects or just used randomly.You can apply this technique by casting up or across stream. After the popper hits the water, let it drift motionless downstream. I like to use this dead drift method over boulder-strewn bottoms or through current seams. I recall an instance where smallmouth would rise from behind a submerged boulder and take the popper as it drifted over the rear portion of the boulder. 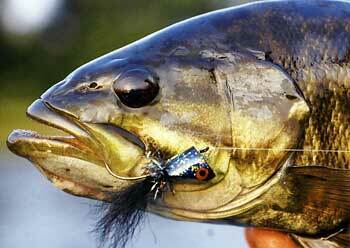 Large smallmouth often rise slowly to inspect the popper and then follow it as it drifts. At times, smallmouth will follow a drifting popping bug some distance before inhaling it. Smallmouth take drifting poppers subtly; in fact, some anglers take their eye off the bug for an instance and wonder where it got to when they try to find it. I have seen large bass look as if they are standing on their tails, with their noses directly under a drifting popper or Floating Minnow, for as long as five feet, and then without any disturbance, they inhale the fly. A variation on this technique is to cast the fly and, when all the rings have dissipated after it lands, give it a subtle twitch. Sometimes bass are too spooked to take a popper immediately after it lands on the water, and letting it sit for a moment before twitching it can work well. Many times, especially on windless days and super-calm, clear water, a bug that is left still for a few seconds and then twitched accounts for more strikes. Another trick is to cast the bug onto the water’s surface, especially where slow-moving current is noticeable, and let it naturally drift without imparting any action. 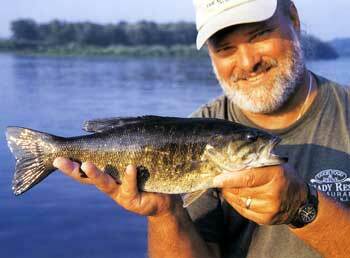 These methods seem to tantalize bass that are found around many types of cover. Rock piles, lily pads, heavy surface grass, and downed trees usually call for a slow, quiet, tantalizing retrieve. When fishing this type of structure with a bug, adding a weedguard made from mono or wire is necessary in order to prevent hangups. The skating retrieve is popular with traditional trout dry-fly fishers of the East, who designed heavily hackled flies that would skate across the water’s surface, as well as steelhead and Atlantic salmon anglers. Skating a dry fly on the surface of the water is an exciting way to catch fish and a deadly and overlooked technique for bass. Heavily hackled flies lend themselves to this presentation, but anglers have reported great success with a Floating Minnow fished in this manner. It’s really very simple. Cast across and downstream at about a 45-degree angle to start. Follow the fly with your rod tip as it skates across the surface. When it reaches a point directly below you, twitch it a few times in case a bass has been following it, and then pick it up and cast it again.You can control the speed at which the fly travels across the surface of the water with mends. Mend upstream to slow the fly down, downstream to speed it up.